The template is beautiful and easy to work. 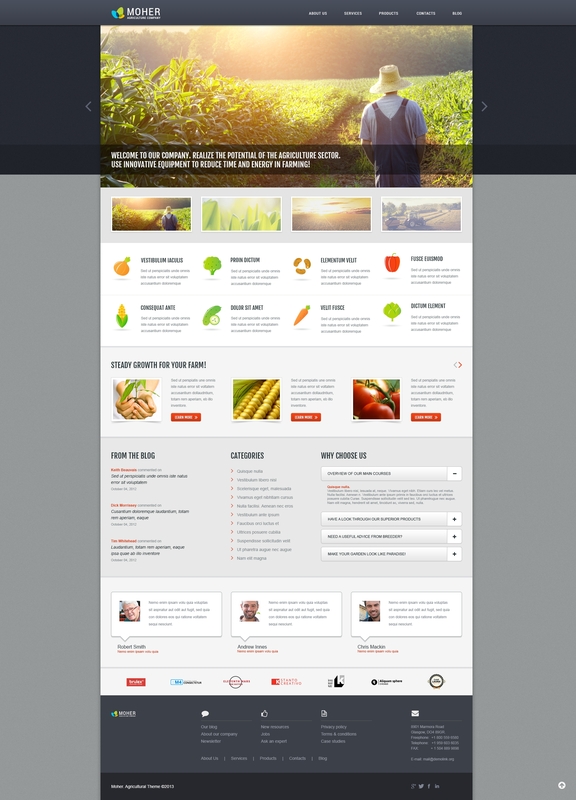 Content readability, usability, attractive visual design Ã¢â‚¬â€œ this is what you get within this theme for agriculture companies. Its simple well-structured layout comprehensively presents the main idea of business. The visual points like large slider with transition effects, nice icons presented as fruits & vegetables, stylish boxes of featured content make the communication with the viewers effective. I am freelance web designer. But I am doing this website for my brother&#039;s new start up company - an Organic fertilizer marketeer. I have done few websites already using template Monster themes. So I didn&#039;t have to think much before choosing one from here. After having decided to do one, I went through almost all available templates with Template monster. This particular theme was really attractive to me. It already had all the images that I was looking for to add in the website. I am really amazed at it. I don&#039;t have to mention that how easy it is to create websites with Template Monster WordPress themes. As usual the installation was a breeze.Cherry Framework made things easy as far as the customization is concerned. The coolest part is these themes really look gorgeous when you view it other devices. It really saves my time, I never have to worry about the responsive element. So I can get the nod from clients very easily. I did not have to show too many designs every time. Moreover Cherry Framework has a SEO module built-in to take care of your site&rsquo;s SEO needs. How cool it is? This is one of the best features available. Support from Template Monster is always fantastic. You will never be disappointed. I highly recommend themes from template Monster since it is meant for both novice and an advanced developer as well. Thanks for having given the opportunity to express my views.